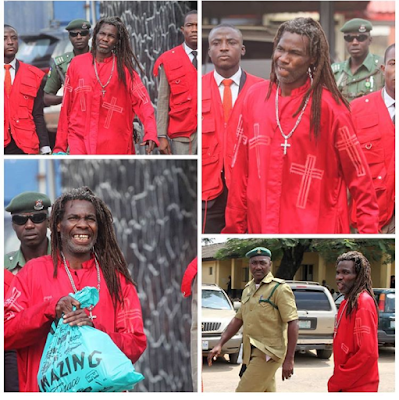 The Economic and Financial Crimes Commission, EFCC, Lagos Zonal office, on Monday, November 5, 2018, arraigned one Prophet Cletus Ilongwo, Founder, Power of the Holy Spirit Evangelical Ministry, Lagos before Justice S.O. Solebo of the Lagos State High Court sitting in Ikeja, Lagos State on an 11-count charge bordering on obtaining money by false pretense to the tune of N59, 760, 000 (Fifty-Nine Million, Seven Hundred and Sixty Thousand Naira) only. The complainant, Obinna Ezenwaka, a former employee of Fidelity Bank Plc, alleged that he was introduced to the defendant's church in 2015 in his efforts to find a solution to what he described as a "spiritual problem". Illongwo, upon knowing the status of the complainant, was said to have mentioned a business, which he claimed would benefit both of them as well as the church. He was also said to have lured Ezenwaka to buy a property located at Diamond Estate, Festac Town, Lagos State worth N59, 760,000, with the assurance that they would resell it to a Chinese company at the cost of N150million. However, Illongwo allegedly reneged on his promise after receiving the money, which Ezenwaka claimed was generated from accounts of various customers of the bank. .
Ezenwaka, who also alleged that Illongwo diverted the money to his personal use, claimed that he was dismissed from the bank over the issue. The defendant pleaded not guilty to the charges preferred against him. In view of his plea, the prosecution counsel, A. Yerima , asked for a trial date and prayed the court to remand the defendant in prison custody. The defence counsel sought bail on behalf of his client. However, the Judge refused to hear the bail application at today's proceedings. .
After listening to both counsels, Justice Solebo remanded the defendant in prison custody and adjourned to November 14, 2018 for hearing of the bail application and November 19, 2018 for commencement of trial.